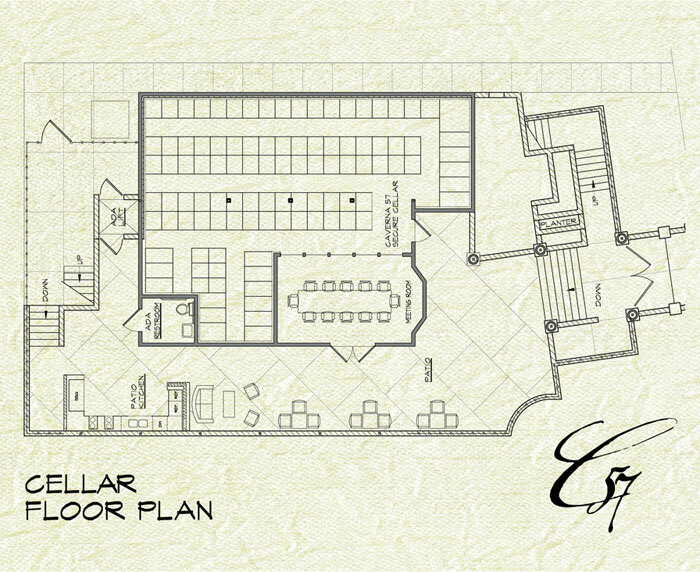 The Sacramento area’s premiere wine storage solution! Caverna 57 Wine Vaults is the regions only fail-safe wine storage facility. We pride ourselves on providing our clients with the highest standard of service, features and amenities of any wine storage facility anywhere. Located in the heart of East Sacramento, our property is an underground fortress equipped with a top-rated climate control system, backup emergency power generation, as well as cutting-edge security and surveillance. Whether you’ve outgrown your home wine refrigerator and need space for some extra boxes or you are reseller in need of a public warehouse with an ABC Type 14 license for bulk product, we have you covered. We’ve literally thought of everything you need to bank your liquid assets safely. Come tour our cellar and see firsthand why our members enjoy the finest and most secure off-site wine storage experience in the region. In the meantime, read on to learn more about the features and amenities that make Caverna 57 Wine Vaults the smart decision for your investment. "Caverna 57's Wine Vaults was the absolute best decision for my wine collection. They have thought of everything a wine enthusiast could want in an offsite storage solution." "Caverna 57 Wine Vaults is the finest storage facility that Sacramento has to offer. I love that I can get a bottle of wine at any time of day or night, hassle-free and it really is an added bonus to have the built-in events venue." "The idyllic atmosphere offered by Caverna 57 far surpasses any other wine storage facility I have encountered thus far. The offering and the property are ideal for all types of events and small gatherings." Fail-safe climate control is the aim by way of refrigeration equipment redundancies and a standby emergency generator with smart-switch technology. We deliver attention to critical details and a level of precaution that is simply unmatched by the competition. Enjoy 24/7 access made possible by superior security protocols including three different barriers to entry utilizing card-key, biometric scanning, and lock and key. What’s more, the perimeter of our property as well as every square inch of our vault room is surveilled by a series of high-quality security cameras. Our cellar environment tracking system provides you and/or future buyers of your wines with historical and real-time data reporting on the temperature and humidity conditions of our vault room. With the ACU>RITE app on your smartphone or desktop, you’re always just a click away from years worth of ‘cool’ data. Other features and amenities include: wine shipment receiving, racking for individual bottle storage, private winemaker tasting events, and an onsite events venue. Caverna 57 Wine Vaults provides an exceptional value with wine storage solutions starting at $49 per month. We are proud to offer a pricing structure that is half of what our most comparable competitors charge. What’s more—we’ll never be undersold! Please contact us with your needs and one of our attentive staff members will be happy to propose a solution that best fits your needs. Whether our building loses power or the whole city does, we have a backup generator with an automatic transfer switch to ensure your wine stays safe. Click here for more information. Can I access my wine collection any time? Yes. 24/7 is made safe and possible by our state-of the-art security features. Click here for more information. Is Caverna 57 ABC Type 14 compliant? Yes. The only self-storage wine facility in Sacramento that is ABC Type 14 compliant. Click here for more information. What length of term do I have to commit to on my wine vault? We offer a six-month or a twelve-month term that renews automatically unless you decide to terminate it at the end of your term. If you choose to pay for the entire 12-month lease, you will earn a prepayment discount of 5%. If you choose to pay for the entire 6-month lease, you will earn a prepayment discount of 2.5%. Can I have the option of doing a month-to-month agreement? Yes. A customer that opts for a month-to-month agreement is required to pay an initial registration fee to offset the initial documentation, orientation and fingerprint scanning costs. Only if you obtain coverage. In keeping with the practices of all wine storage facilities, you are encouraged to self-insure. We are happy to make suggestions on a number of insurance companies that specialize in policies designed for your wine collection. What is the size or capacity of your wine lockers? We offer the following size units:120 bottles, 135 bottles, 16 cases, 24 cases, 30 cases, 60 cases. Mix and match various combinations of bottle storage units and/or box storage units to receive pricing based on your total capacity. We are proud to offer the best value of any facility of our kind. Customers that opt to pay for a 12-month term, in advance and by check only, receive a 5% discount. Customers that opt to pay for a 6-month term, in advance and by check only, receive a 2.5% discount. What’s more, we promise to never be undersold. If we’re somehow not competitive with some other like kind offer you’ve found, just tell us and we’ll match it! Shared workspace solutions featuring office suites, meeting rooms and virtual office space. An intimate and private events venue for celebrating special occasions of all kinds.